MILWAUKEE – June 23, 2015 – Today at Miller Park, Associated Bank and the Brewers Community Foundation are launching “Hits for Homes,” a program that will directly benefit Housing Resources, Inc. (HRI), a nonprofit organization that provides support to low- to moderate-income homeowners and home buyers in the Milwaukee community. 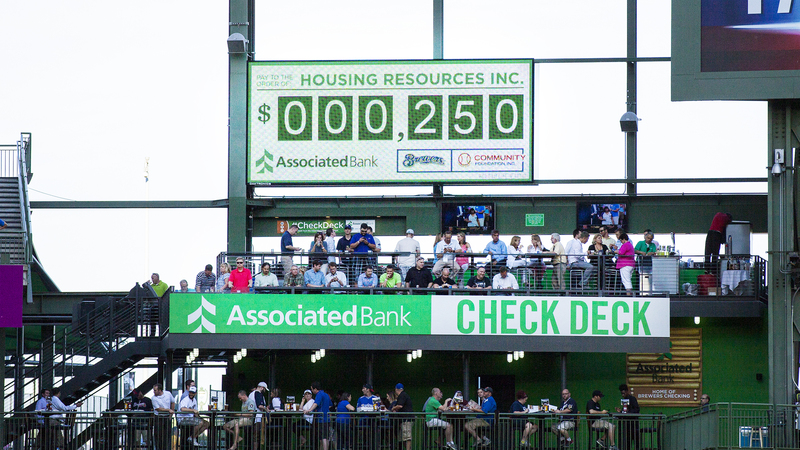 For every hit recorded by the Brewers during home games for the rest of the season, Associated Bank and Brewers Community Foundation will be teaming up to donate $250 to HRI, up to a combined $100,000. Donations will be given to HRI and used for affordable home repair grants designed to assist homeowners who experienced financial distress and deferred maintenance on their properties in Milwaukee County, Ozaukee County, Washington County and Waukesha County. Associated Bank strongly believes in the mission of HRI to empower people to live their dream of successful home ownership through education, advocacy and supportive services. Associated has been a proud partner and supporter of HRI since 2013, and has a history of partnering to support homeownership in the Milwaukee community through advisory board and volunteers’ participation in teaching courses about homeownership. “Thanks to organizations like Associated Bank and Brewers Community Foundation, we are able to help many families. We are excited about and grateful for this partnership,” said Housing Resources executive director, Trena Bond. Each hit and corresponding donation will be tallied on the Associated Bank Check Deck Screen, located above the Associated Check Deck. For more information about how to apply for grants from HRI, visit hri-wi.org. "Brewers Community Foundation recognizes the critical need for affordable, safe housing. We are happy to partner with Associated Bank to positively impact children and their families," said Cecelia Gore, executive director of Brewers Community Foundation. In addition to Hits for Homes, fans can choose to open a Brewers™ checking account and debit card at Miller Park and receive a $75 certificate to the Brewers Team Store by Majestic or an Ultimate Brewers Experience. The Ultimate Brewers Experience will be on Sunday, September 27th from 10 a.m. to 1 p.m., including opportunities for batting practice, playing catch in the outfield, pitching in the Brewers bullpen, going down Bernie’s slide, photo opportunities with a Brewers legend, Bernie Brewer and the Famous Racing Sausages. The Brewers Checking account includes perks such as 2-for-1 ticket discounts on select games, a 10 percent discount at the team store, Brewers checks and debit cards, as well as exclusive access to the Associated Bank “Check In” gate located at left-centerfield. For more information, visit www.associatedbank.com/brewers. Fans can also stop by the Main Level Concourse near Section 113 to experience the Home Run Challenge game. Next to the game area, they will find Associated bankers who are available to answer questions and help them open a Brewers™ Checking account with added perks.